By contrast, the national incarceration rate grew by 12 percent during the same time period, and was accompanied by a more modest decrease in serious crime of 42 percent. 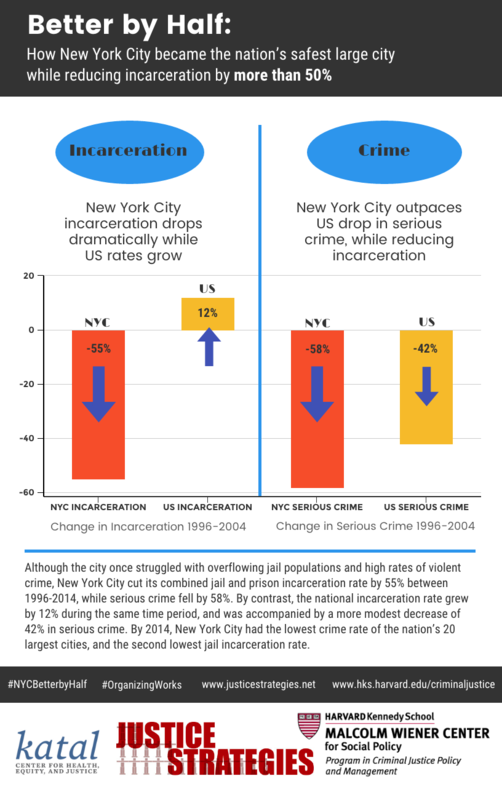 By 2014, New York City earned the distinction of having the lowest crime rate of the nation’s 20 largest cities, and the second lowest jail incarceration rate. And New York State had become one of three states (along with New Jersey and California) leading the nation in terms of prison population reductions. Reductions in the incarcerated population allowed entire prisons to be closed and annexes to be shuttered, saving millions of dollars and making prisons safer for staff and the people imprisoned. All of the decline in New York State prison population was attributable to New York City, as the number of individuals incarcerated in the rest of New York State rose over the last two decades. Better by Half is also the story of the tenacity and dedication of a community of criminal justice advocates whose work helped reverse decades of draconian Rockeffeler drug laws. 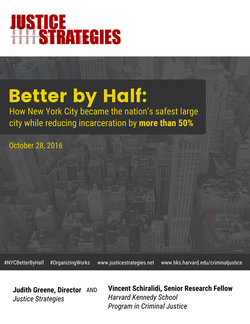 Notably, research suggests that New York City’s dramatic transformation was driven by vigorous advocacy and organizing campaigns calling for repealing and reversing the laws and policies that were generated during the tough on crime era and the War on Drugs.